"Wines That Dance On Your Palate!" Overlooking the Cachagua region of Carmel Valley, (“Cachagua” is believed to be an Indian derivative of the French “cacher” and the Spanish “agua” – “hidden waters”), and framed by the dramatic surrounding hills, lie the beautiful vineyards of the Heller Estate Organic Vineyards. The vineyards are planted with Cabernet Sauvignon, Merlot, Cabernet Franc, Chardonnay, Chenin Blanc, Pinot Noir, Petite Sirah, Malbec and Petit Verdot at an altitude of 1200 – 1500 feet. 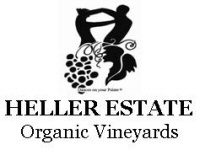 Nestled in the sunshine-bathed amber hills above the Cachagua region of Carmel Valley (Monterey California) and brushed by gentle cooling ocean breezes, Heller Estate Organic Vineyards has been producing luscious fruit-laden grapes since 1970. Planted on 120 acres above the Hidden Springs of Cachagua, these grapes are essentially dry-farmed, with a minimum of irrigation. Heller Estate wines are produced from Certified Organically Grown Grapes from our Carmel Valley Wine Estate, grown without pesticides or herbicides. The modern, efficient winery produces award-winning Cabernet Sauvignon and other wines of world-class recognition, aged in French oak barrels.